I have my hippo dignity! Modeling the bunting shadowhwk made for him! 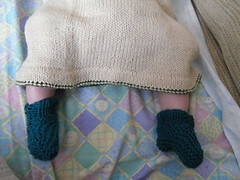 …with socks by irishkate. These are amazing baby socks. They actually stay on a baby! I may have a line on a proper baby-sized fedora. I don't suppose you'd mind taking his headband measurements for me? It was 14 & 5/8ths a few weeks ago. I'll check again. I haven't been able to trace one small enough yet - so I certainly don't think you are kidding - I was beginning to think I would have to make one..
What a handsome little fellow he is. How dapper in his bunting! He's just too cute. And his eeyyyyeeees. 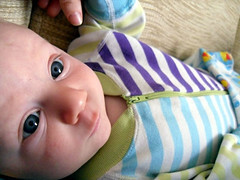 I was very poor at taking photos of Arthur as a baby and as he grew--taking photos does not come naturally to me. Socks that stay on a baby! What a marvelous concept! 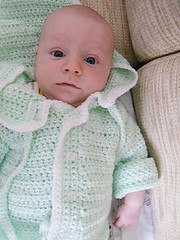 I only got one set of knitted/crocheted items from one aunt--in sun yellow acrylic, after he was too big to wear them. 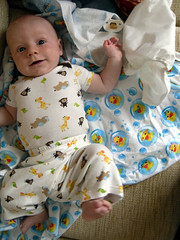 Me, I'm allergic to most wool, but cotton is a great inexpensive alternative. We did have one friend who knitted a small blanket in flecked purple that was useful and pretty. 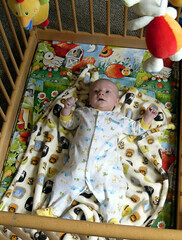 We had a wind up mobile that Arthur adored. I forget completely what the danglies were! Keep sending us photos of adorable Indy! I affirm his hippo dignity! 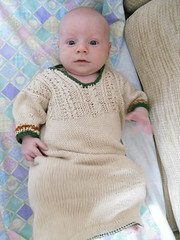 Also, in the picture with the sweater, he looks a lot like his father. Something about the expression. Or maybe just the sweater. He is getting so big. I love those outfits! !